May « 2011 « What will I cook today? The Grapefruit Honey Yogurt Scones and slightly improvised Lemon Cherry Scones were, in a word, amazing. Cinnamon is a mutual love of myself and my boyfriend. Which caused him to send a “breakthrough!” text at approximately 10:48 PM one Saturday night. With cinnamon bun (vanilla) icing! Place a rack in the center of the oven and preheat to 425 degrees F. Line a baking sheet with parchment paper and set aside. In a medium bowl, whisk together flour, baking powder, baking soda, 1/2 teaspoon cinnamon and salt. Set aside. Combine 1 teaspoon + 1/4 teaspoon of cinnamon and the turbinado sugar. Measure 2 tablespoons of the cinnamon/sugar mixture and add to the flour mixture. Save the remaining cinmamon sugar for topping the scones just before baking. Dice cold butter into small chunks and add to the dry ingredients. Using your fingers, and working quickly, break the butter down into the flour mixture until butter chunks are the size of oat flakes or small peas. The butter and flour combined will resemble coarse meal. Add the honey, plain yogurt, and pecans and fold in until the flour is moistened–don’t overmix. It’s okay if you still see a little yogurt here and there. Turn the scone dough out onto a lightly floured surface. Form into an 8 inch circle, about 1 inch thick. Use a knife or a bench scraper to cut the dough into 12 scone triangles. 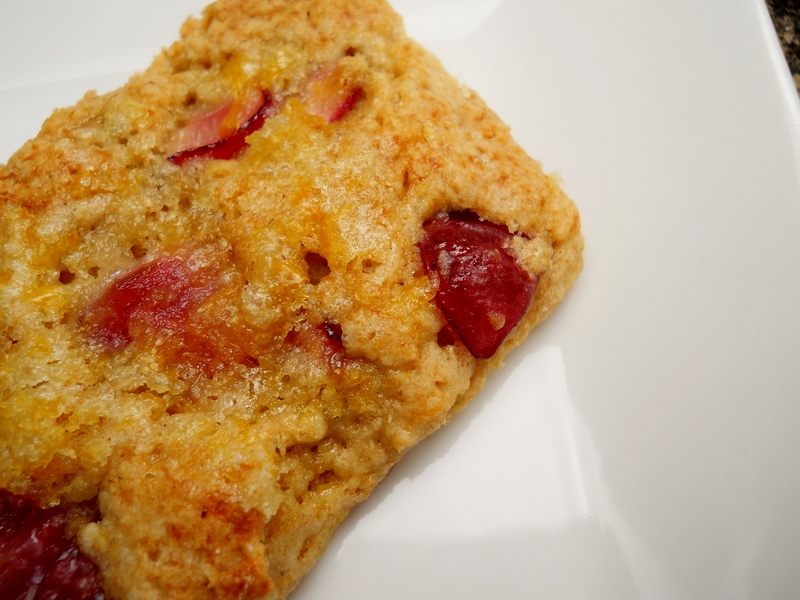 Place on the prepared baking sheet and mold into little rustic scone shapes. Lightly brush the tops of the scones with [soy]milk or buttermilk, and sprinkle with cinnamon sugar. Bake for 13 to 17 minutes, depending on how big you made the scones, until golden brown on top and firm but soft in the center. Allow to cool on the pan for 10 minutes before serving. 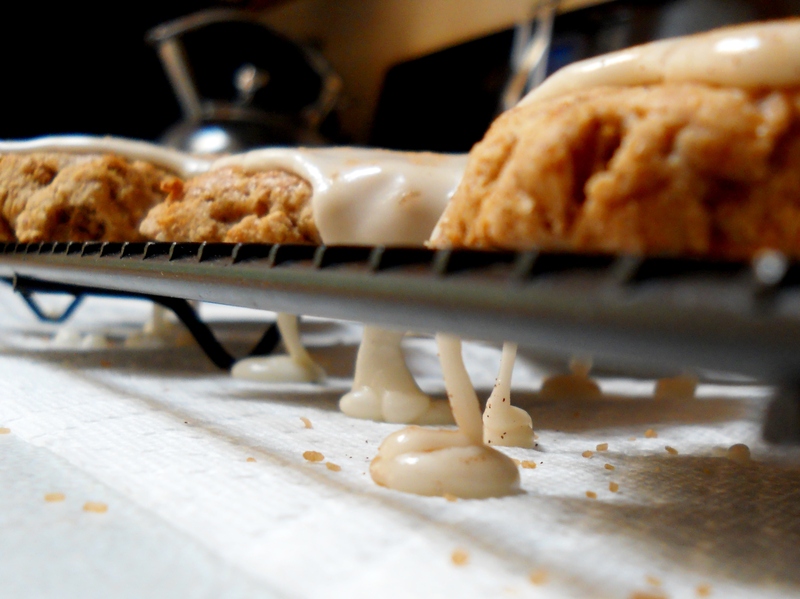 Then place on a cooling rack with a paper towel or aluminum foil underneath to catch the drips of delicious melt-in-your-mouth vanilla icing. While they bake, mix the powdered sugar, milk, and vanilla extract until desired consistency (thick but viscous). Drizzle onto scones and top with more cinnamon sugar. The icing will melt into the still-warm scones. These were so fantastically awesome. 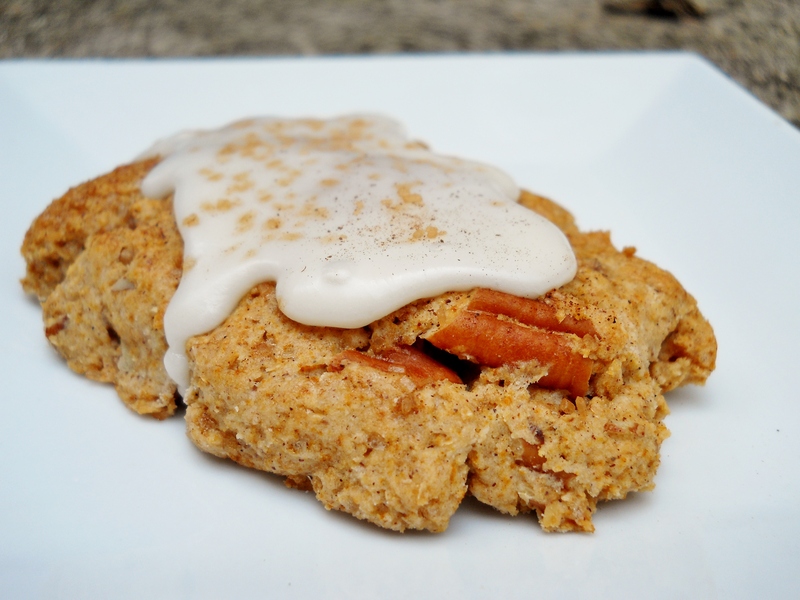 A “triple-whammy” of flavor — cinnamon in the scone itself, cinnamon in the cinnamon sugar topping before baking, and then a final sprinkle on top of the frosting just before EATING! We were not sure how much cinnamon to use, but I think that what we did was the perfect amount. 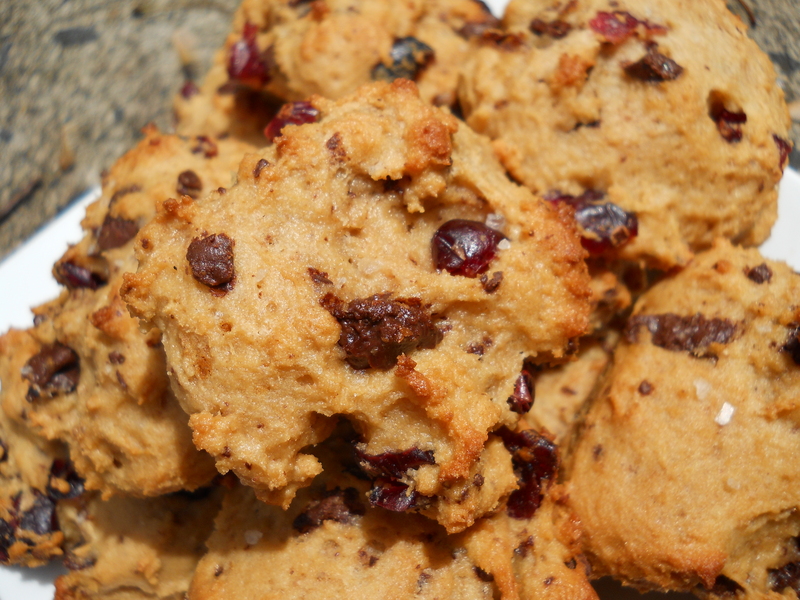 The scone itself still had a perfect consistency–still moister than the average scone. The pecans gave it an extra oomph–I think all scones need a little extra texture in them whether it’s dried fruit, fresh fruit, nuts, etc., and cinnamon + pecans are a natural pairing. But the vanilla icing just pushed these over the top. I attempted making Eggplant Parmesan using a slightly unconventional recipe, using almond meal rather than breadcrumbs for the eggplant slices (e.g, gluten-free). Due to very fast replies, I was able to make it the same day as I asked via comment how many eggplants were used! Thanks a lot, Katie! The sauce was really good. I topped the whole thing off with Pecorino Romano, so I guess you could still call it “faux parmesan” as in the original recipe; said recipe called instead for pepper jack cheese, of which I had none. First, you have to make the sauce. Heat olive oil in a large pot to medium. Add diced onions, and sprinkle a little salt on them, and stir occasionally. Add garlic when onions are translucent. Add spices, stir, and then add tomatoes. After tomatoes are hot enough to bubble a bit, turn heat to medium low. Stir occasionally and let it simmer for 30 minutes. Taste test and add more spices if need be! Then you gotta do the eggplant. Slice eggplant into ~1/2″ thick rounds. Sprinkle with salt. On a plate, add 1/2 C almond flour, and sprinkle with salt. Stir. Whisk 1 egg in a wide bowl. Heat a pan on medium, adding enough olive oil to cover the bottom. 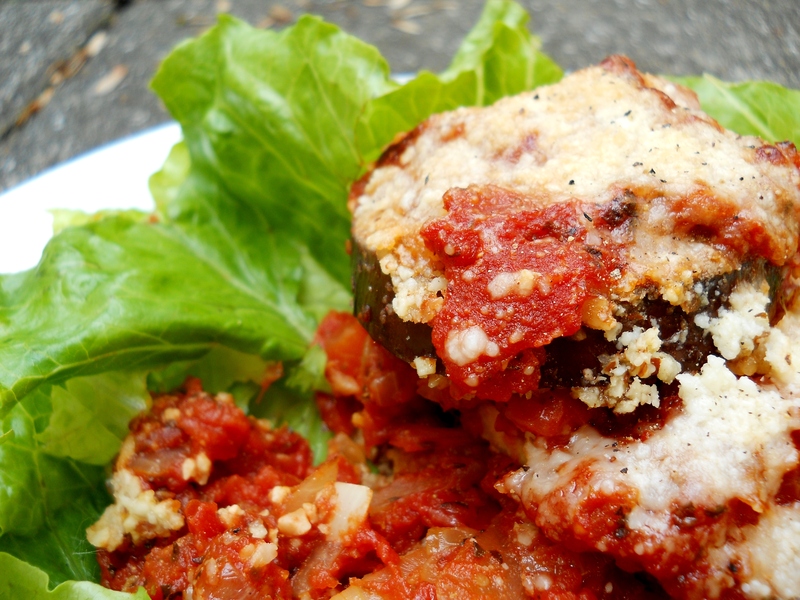 Dip eggplant completely in egg, and transfer to almond meal, covering both sides. Repeat, flipping pieces when underside browns. Remove once both sides are browned, but make sure they are cooked through*. Use a paper towel to remove burny bits of almond in the pan. 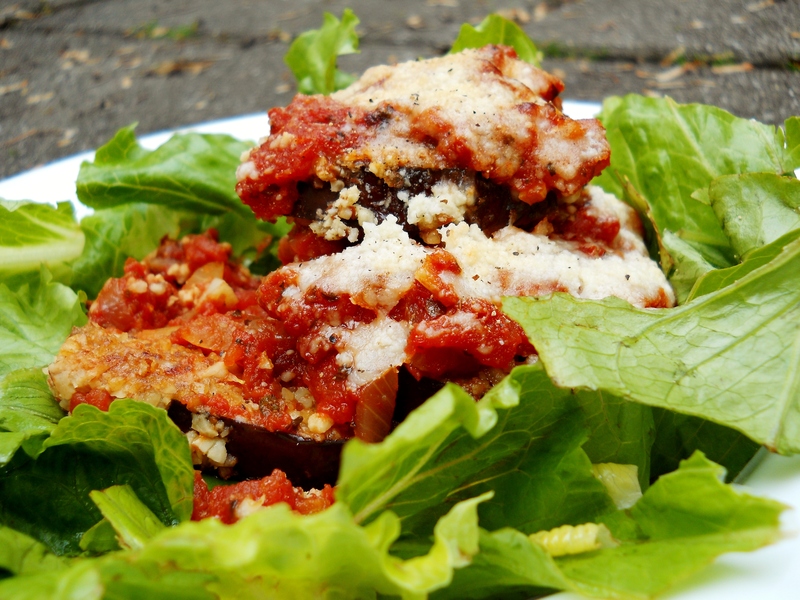 Use eggplant slices to cover the bottom of a 9 x 13 baking/casserole dish. Layer leftover slices on top. Cover with marinara again. Sprinkle pecorino romano all over. Broil carefully to melt cheese. Serve hot… or cold, which is apparently really good too, according to my mom who had seconds later on. I messed up on a few things with this recipe… and so will post my mistakes here so you won’t make them, should you try it! *I didn’t always refill the pan with oil, so the eggplants slices did not always get cooked through even though both sides were browned. Make sure they are cooked! Or perhaps baking the casserole for a bit and then broiling the cheese on top would help avoid crunchy eggplant in the end product. But, to end on a good note, this is a really good recipe and if not for my kitchen blunders would have been super amazing. I’m game to try it again. So about a week ago my family and I went to the city to visit Memorial Sloan-Kettering Cancer Center, where I will interning this summer. We ate at P. J. Clarke’s (915 3rd Ave, New York, NY, 10022), a sort of Irish pub restaurant not far from where my apartment will be. Pictures are shaky due to dim lighting and growling stomachs. 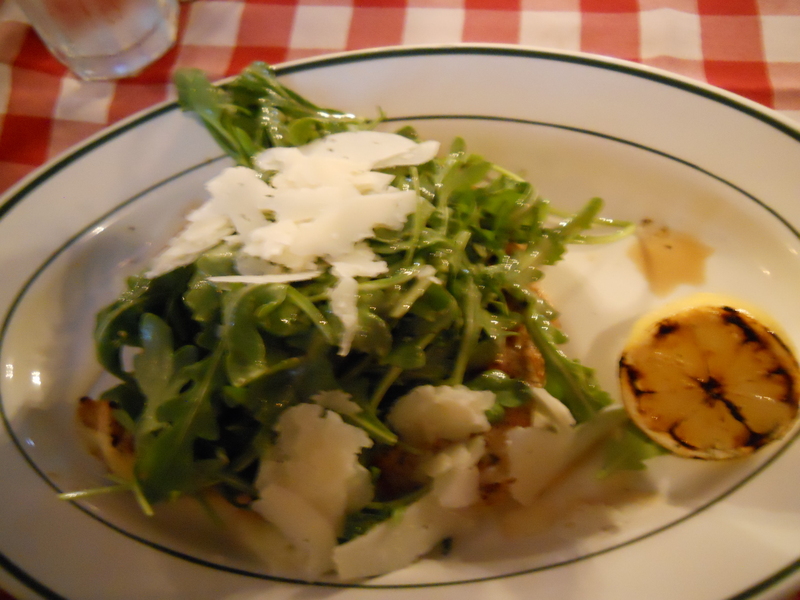 Above is Chicken Paillard with Arugla Salad and Shaved Parmesan… And a grilled lemon, which was pretty cool. It was pretty good; a little too much dressing on the arugula though, kind of drenched. The chicken was cooked really well and nice and charred on the underside. 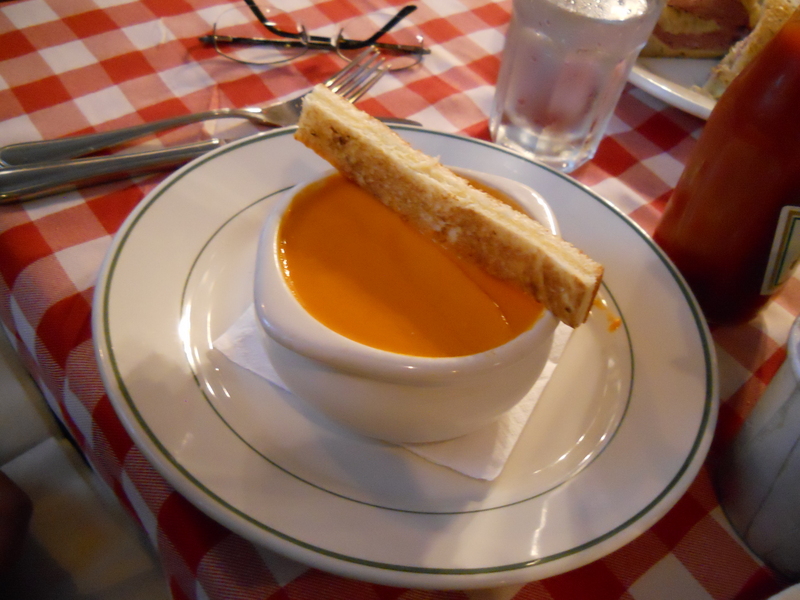 Another dish: Creamy Tomato Soup with Farmstead Cheddar Crouton. My mom gave it good reviews but wished there was another crouton! 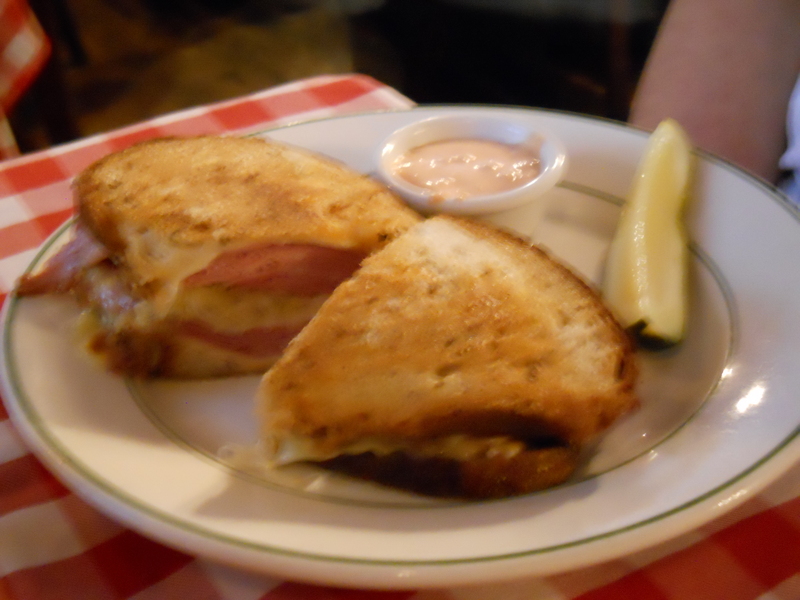 And a really awesome picture of my dad’s Corned Beef Reuben with Swiss and Homemade Sauerkraut. Also got good reviews. My dad was a happy camper. We have been to this restaurant before, but a different location at Lincoln Square (44 W 63rd St, New York, NY, 10023). 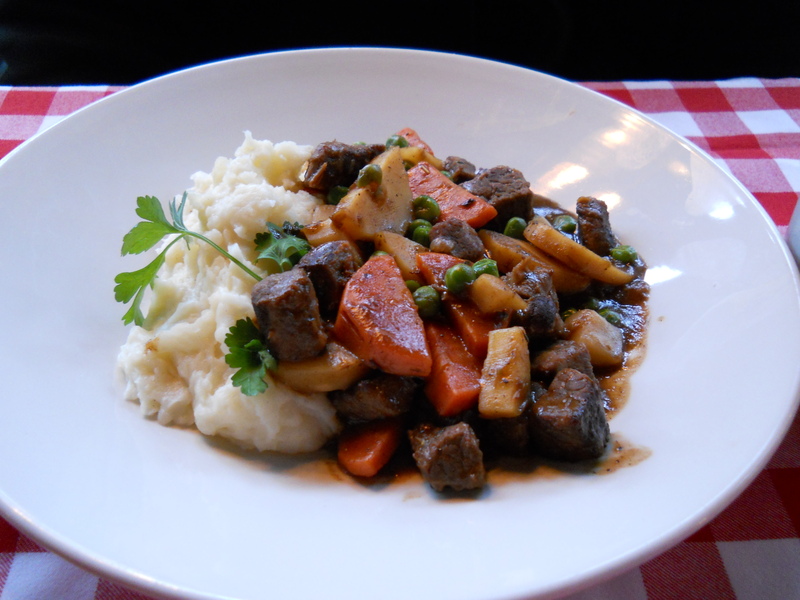 That day, my dad got himself Irish Beef Stew with Toasted Mashed Potatoes… He liked it very much. Mom got a side of Jumbo Grilled Asparagus, and Roast Beets, Orange, Walnuts & Mache, Yougurt Dressing. She thoroughly enjoyed! 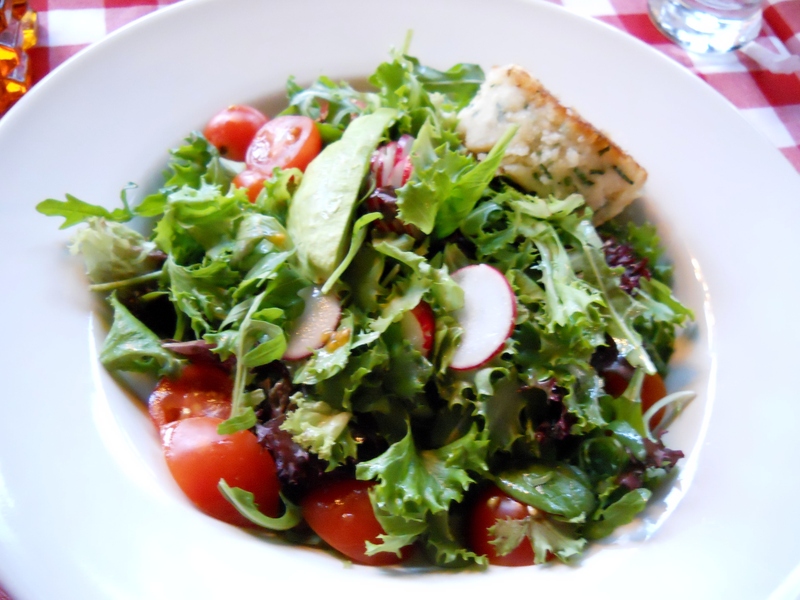 And I got something not explicitly stated on the menu… a crab cake on a salad of mixed greens, tomato, avocado and sliced radishes. Tres delicieux. Overall, it’s a pretty good restaurant but too pricey to eat there all of the time. I liked the location by Lincoln Center better than where we went the second time, P. J. Clarke’s 1884… The overall atmosphere at 1884 was so dark and noisy, while the former was much more bright and welcoming. Both locations also have a raw seafood bar which looked pretty good, judging by peering over at other peoples’ tables. 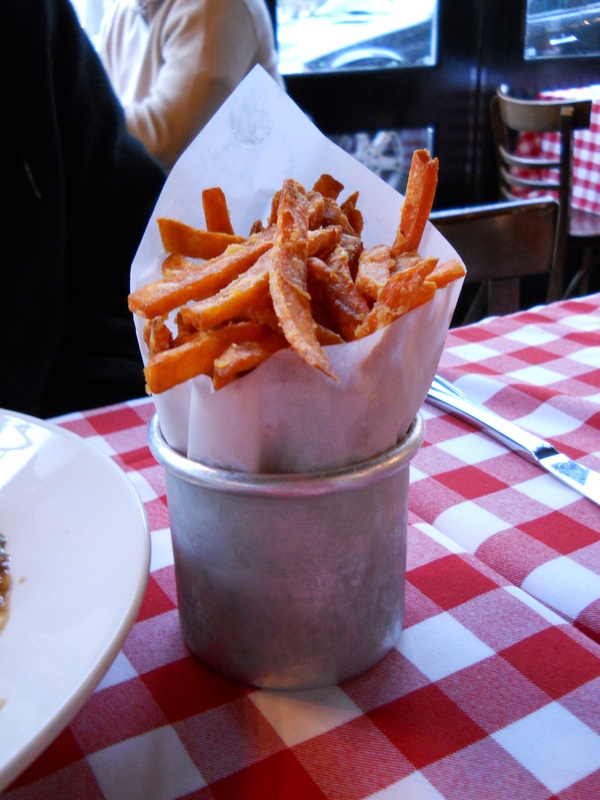 And their sweet potato fries are awesome. 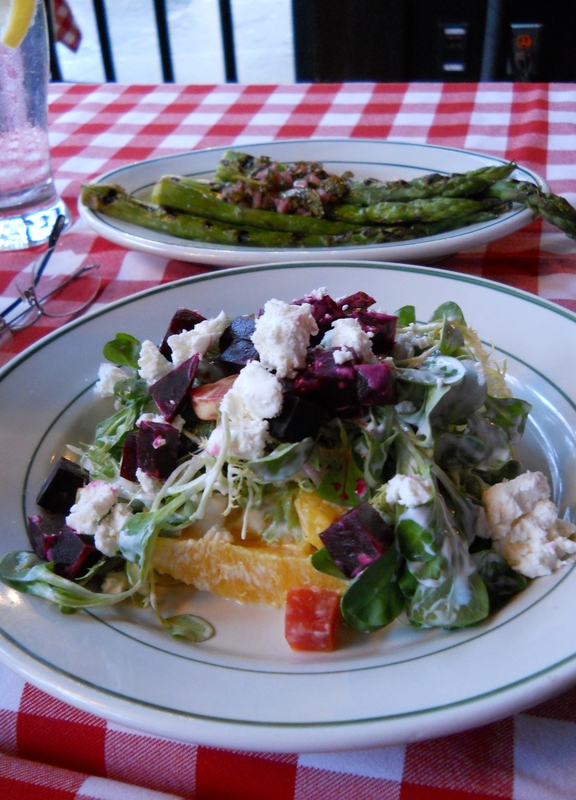 Try P. J. Clarke’s at Lincoln Square for a nice meal out! 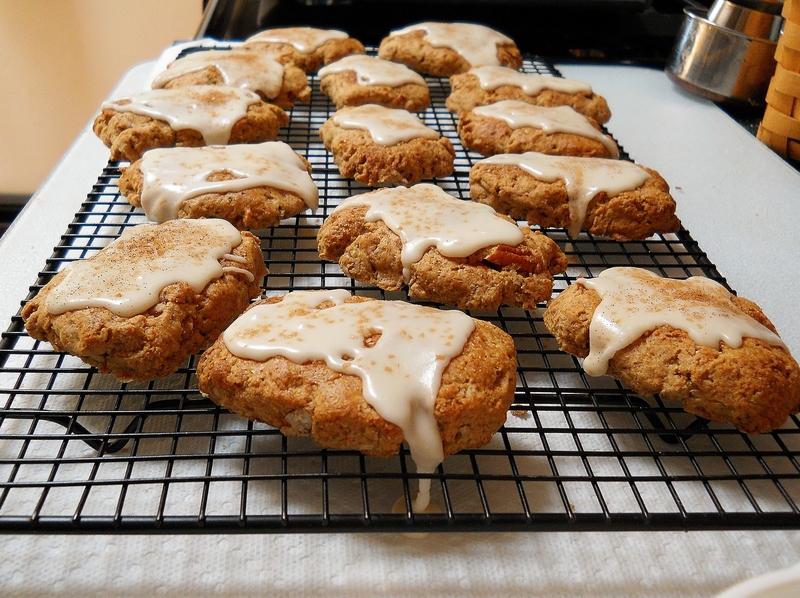 The Grapefruit Honey Yogurt scones got rave reviews from all who tasted them. So much so that a request was put in by the boyfriend. 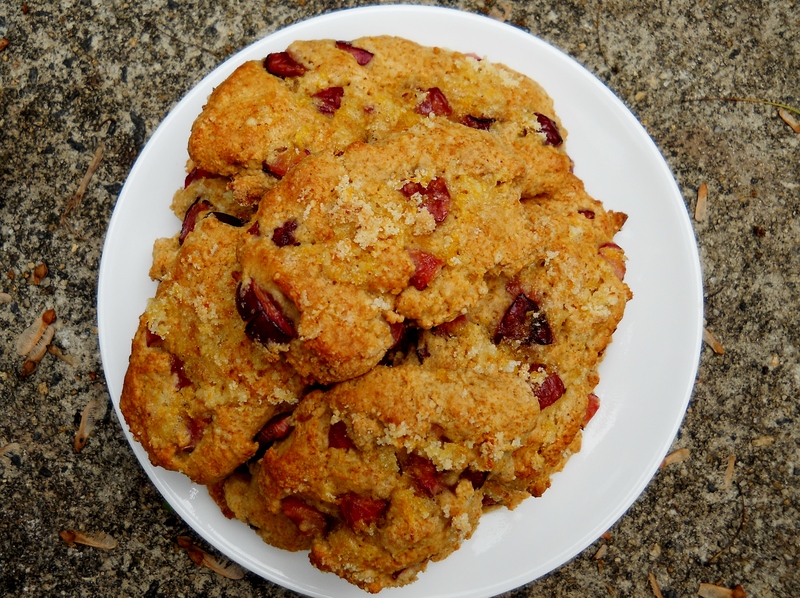 A scone, just like the grapefruit ones, but with cherries. And so, he became my sous chef. We decided that rather than grapefruit, lemon would be a better choice for the zesty sugar. We were right. These were so amazing. 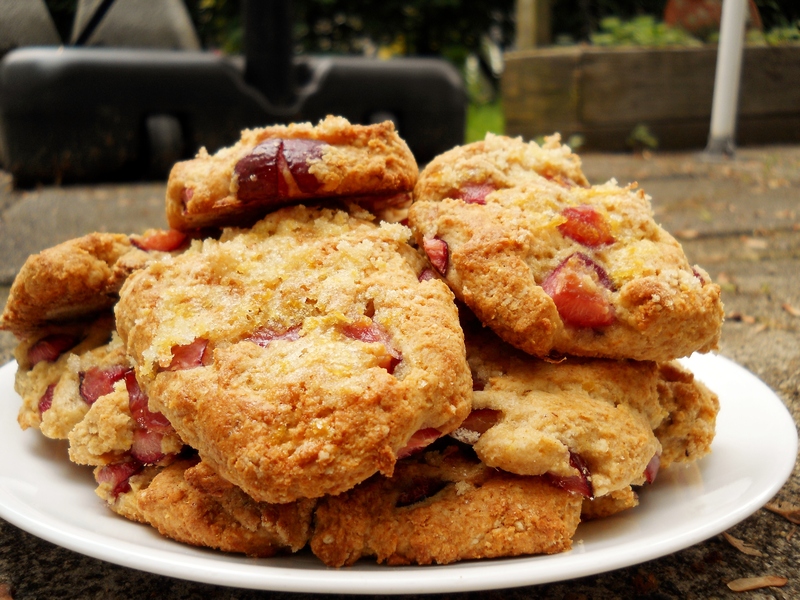 Maybe you have had dried cherries in scones before, but fresh cherries just scream spring/summer. Plus that crunchy lemon sugar topping… divine. Zest the lemon and combine zest and granulated sugar on a clean cutting board. Rub together the zest and sugar with the back of a spoon or a plastic bench knife. Measure 2 tablespoons of the lemon sugar and whisk into the dry ingredients. Save the remaining lemon sugar for topping the scones just before baking. Dice cold butter into small chunks and add to the dry ingredients. Using your fingers, and working quickly, break the butter down into the flour mixture until butter chunks are the size of oat flakes or small peas. The butter and flour combined will resemble coarse meal. Add the honey, and plain yogurt. Toss together with a fork until all of the dry ingredients are moistened by the yogurt and honey. Fold in the chopped cherries until as evenly dispersed as possible. Bake for 15 to 17 minutes, until golden brown on top and firm but soft in the center. Allow to cool on the pan for 10 minutes before serving. Yes, chocolate chips count as a fruit. In fact I like to eat most seafood. I have made salmon dishes before but have never ventured further than that. But after making this dish, I am so glad that I did. Clean and pat dry shrimp, then season with salt and pepper. Heat a large skillet over medium-high heat, adding olive oil and 2 tablespoons butter. Add sliced shallots with a pinch of salt and sauté until soft, about 3 minutes. Add in minced garlic, then immediately add in shrimp (this prevents the garlic from burning) in one layer. 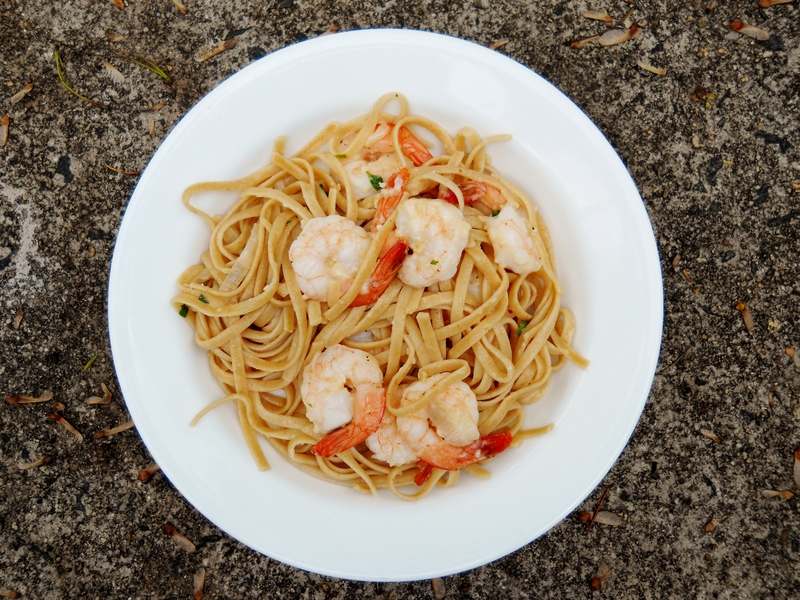 Cook for only 60 seconds, then flip shrimp and cook for 60 seconds more. Pour in white wine and let mixture simmer for about 2-3 minutes. Turn off heat and stir in the last tablespoon of butter. 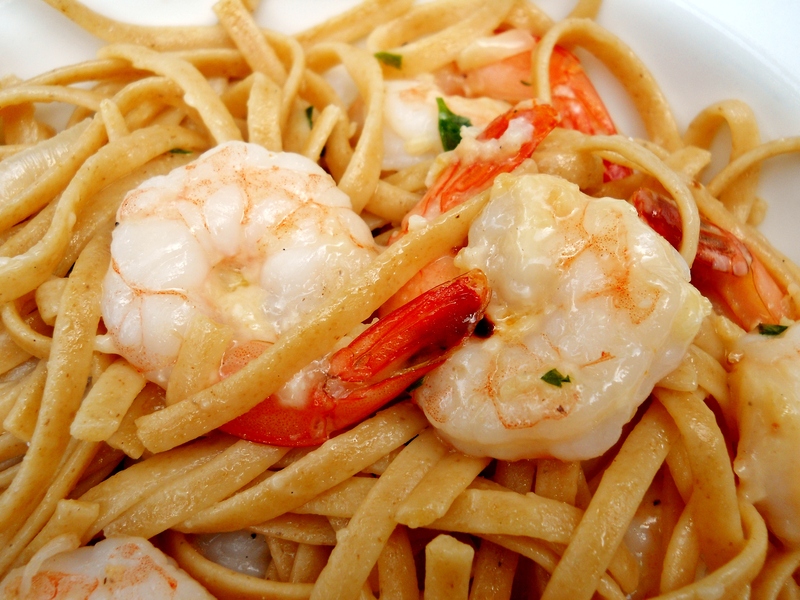 Add all pasta to a large bowl and pour entire shrimp and wine mixture over top. Add red pepper and cheese and toss until everything is combined. Add additional olive oil or salt and pepper to taste if desired. Sprinkle with parsley and serve with garlic bread. This shrimp scampi was so amazing. 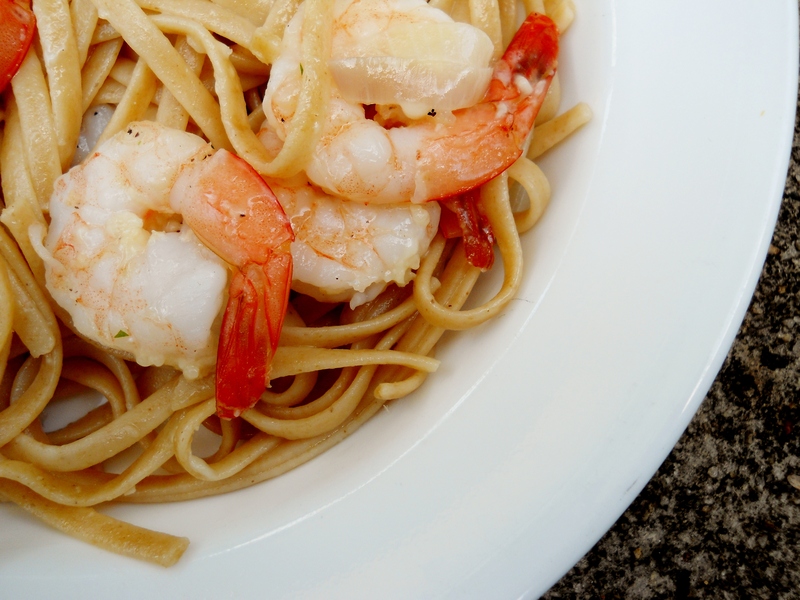 The pasta soaked up the white wine sauce, and the shrimp were cooked perfectly. Tails on for prettyness and flavor; they were easily separated while eating. The sauce was light and perfectly accented the entire dish rather than overwhelming it. We kind of winged it with the shrimp. (Is it cooked? Looks pink to me! I’m not sure… Oh well!) I think they cooked for a little bit longer than what the recipe called for, but they turned out perfectly. We actually had to cook them in 2 batches because we doubled the recipe… which was a really, really, really good choice. This will make a definite reappearance in my kitchen. As you may come to notice, a lot of the inspiration for the recipes I attempt comes from the need to use up a surplus of an ingredient in our house. This time, it was Fage Total Classic (the whole-milk kind–I really don’t like it by itself; I worked it into a few recipes but still had some to deal with) some chocolate chips that had melted on the way home from college and re-formed into a solid mass that I chopped up into chunks, and some old brown sugar from a baking adventure a long time ago. Did you know that microwaving frozen, hard-as-a-rock brown sugar totally works to soften it? Happy discovery. This was a definite experiment in the kitchen. They truly are yogurt cookies; yogurt is the only fat and liquid (besides the vanilla extract) that holds them together. 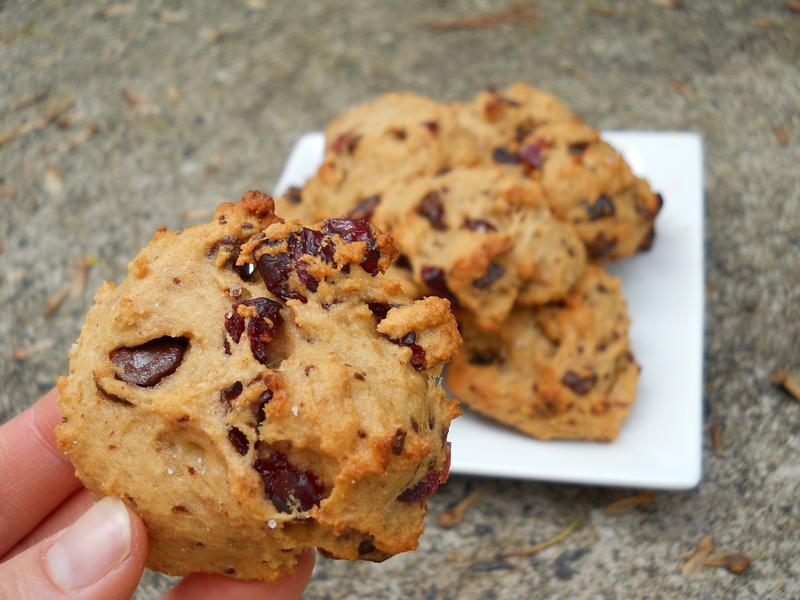 Chocolate chips and dried cranberries with a sprinkle of sea salt on top? Da bomb. Preheat the oven to 375 degrees F (190 degrees C). 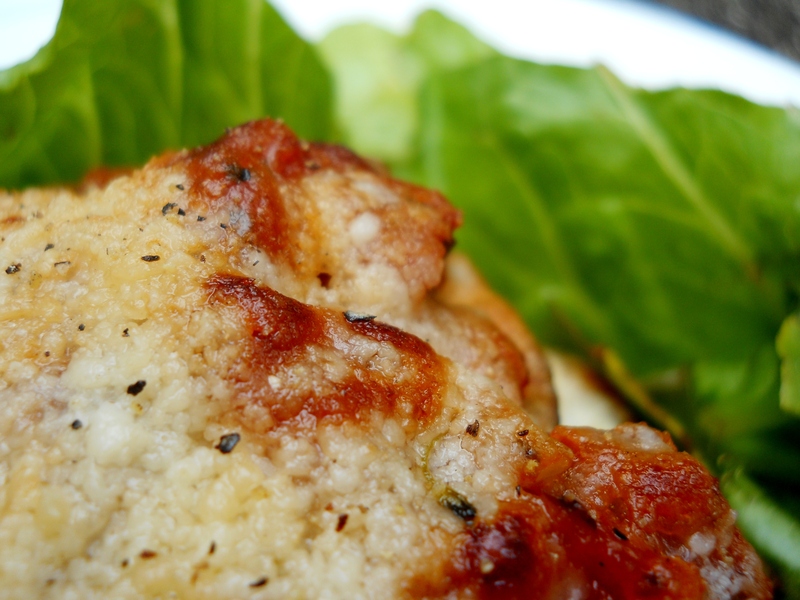 Grease cookie sheets or use a silicone liner. In a medium bowl, stir together yogurt and vanilla and add brown sugar; mix until any lumps of the brown sugar are gone. Combine the flour, baking soda, and salt; stir into the yogurt mixture until incorporated, then mix in chocolate chips and cranberries. Drop by rounded tablespoons, onto the prepared cookie sheets. Flatten them a little so they cook through better, space about an inch or two apart. Sprinkle a bit of sea salt on the tops before baking. Bake for 15-20 minutes until tops are brown. It took a while for me. Cool for a minute on the cookie tray before removing. I didn’t count, but counting the 5 that I immediately inhaled and the 7 my taste-testers devoured… I would say this made maybe 24-30 cookies. These tasted a bit doughy to my Dad and I. I would use less flour next time. I eyeballed pretty much everything so that may have been a factor. Also the original recipe calls for 1/2 cup of butter and 1/2 cup 0% Greek yogurt; I substituted a whole cup and then some of full fat Greek yogurt. My mom really liked them though. I would definitely try them again. If you make them let me know how they turn out! New York City 10019) for lunch. We got these appetizer (complimentary) rice cracker things first off. They were pretty addicting. 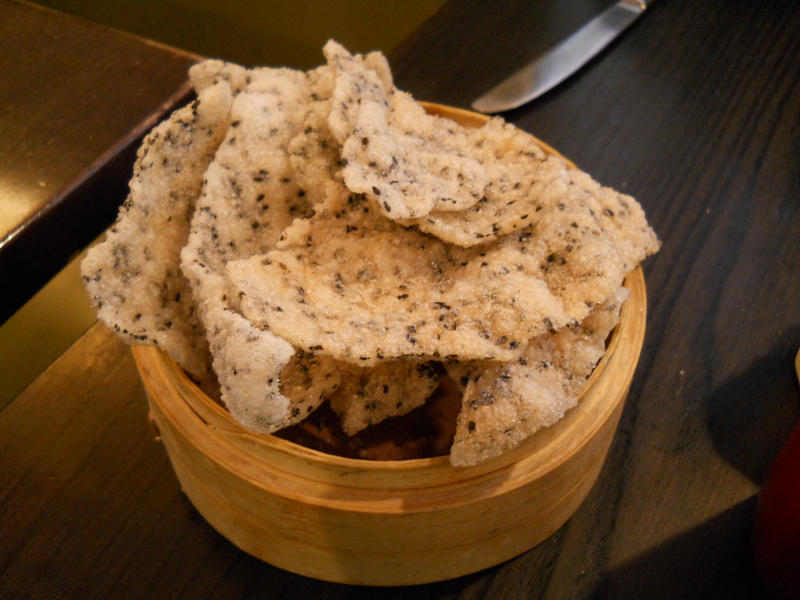 Lightly fried, crunchy and a little salty with a some sweet sugar granules coating the outside. Mysterious black seeds baked into them. We asked our waiter what the black things were; I guessed black sesame seeds. He informed us they were in fact peppercorns. I really don’t think so… there was no hint of pepper at all and they were distinctly seed-like! But yeah, this basket was demolished. 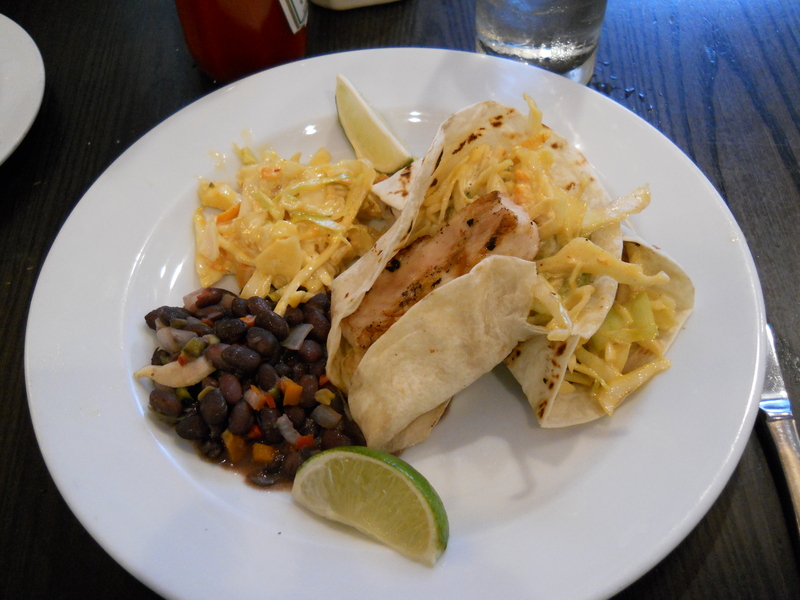 I got the Soft Tacos with Mahi-Mahi and Chipotle Mayo Coleslaw. Mine was really yummy. There was guacamole in the taco. The chipotle mayo coleslaw wasn’t too hot for me and the black beans were also done nicely. The mahi-mahi was cooked really well too, nice and flaky. I was pretty happy until I found a definite rock in my mouth. The waiter said that it might be because their vegetables are organic and so apparently that means they can’t be well-washed… as opposed to non-organic vegetables, which appear to not grow in dirt and rocks? Oh well. I’m pretty sure it was a rock, hope it was a rock… I’m not dead yet! 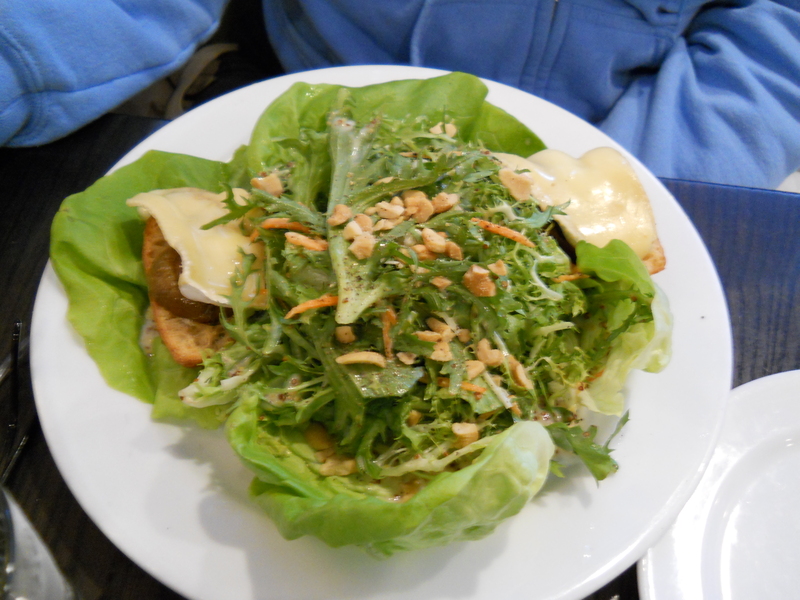 My mom got the Eatery Summer Salad with grilled pears and brie. She liked it. The whole-grain mustard vinaigrette was strong but delicious! We skipped on the desserts; they seemed kind of generic. Overall, it was an okay experience. I would come back, but maybe at a less busy time.